New Jersey recently adopted a rule modifying the Uniform Construction Code (UCC) and the Uniform Fire Code (UFC) to require Carbon Monoxide (CO) detectors in all use groups. Previously, CO detectors were only required in use groups where occupants would be sleeping unattended, including group I-1 and all group R buildings. Carbon monoxide is primarily a concern in buildings with fuel burning appliances. If a building has natural gas or oil fired appliances such as a furnace, boiler, water heater, stove, clothes dryer, etc, then CO detection will be required. This requirement is retroactive under UFC, meaning all buildings with fuel burning appliance must now comply. The law is currently in effect and there is no grace period. This requirement will likely be enforced during the annual fire inspection process required for most commercial buildings. The requirements for CO detection also apply to new construction. Relevant changes have been made to UCC via errata to IBC 2015 NJ edition, which can be downloaded here. Requirements for additions, alterations and reconstructions can be found in the Rehabilitation Subcode. The retroactive requirements in UFC for non-residential use groups are outlined below. Carbon monoxide detection is required to be installed in the immediate vicinity of all sources of carbon monoxide. Spaces adjacent to the source of carbon monoxide. In the immediate vicinity of any shaft, including but not limited to, stair towers, elevator shafts and ventilation shafts at the level of the potential source of carbon monoxide. In the room at the first register or grill off the main duct trunk(s) from the HVAC equipment that is a potential source of carbon monoxide. In any story that is within two stories of a source of carbon monoxide. 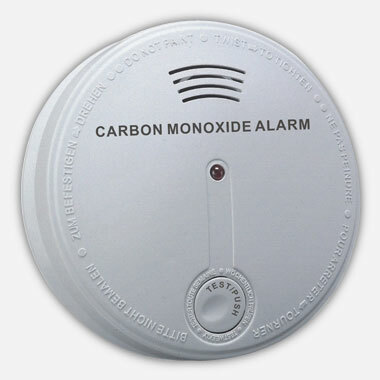 There are specific cases where the UFC exempts the installation of carbon monoxide detectors. These include repair garages, battery charging areas and most warehouses. Carbon monoxide alarms may be battery-operated, plug-in, or hard-wired. Combination fire and carbon monoxide detection systems are permitted. The alarm must provide sound at a level that is 15dB above ambient sound. There is no requirement for fire department notification. Additional information is available in DCA Bulletin 2017-1 which can be downloaded here.